Buying a used car can be a daunting task. How do you know if you’re making a wise investment? Are you getting the best deal? Will the car be reliable? All this is daunting enough when you’re checking websites or dealers. But then someone asks, “why not go to an auction?” You’re now in cold sweats territory. My first visit to an auction house was five years ago when I met Merlin O’ Reilly in his vast auction house off the Naas Road. Before that visit, I didn’t know that Joe Public could benefit from this relatively untapped car market. I was fascinated. More recently, I had reason to go to Wilsons in Dublin. After five years of not attending an auction, Wilsons sucked me right back in. Sad as it sounds, I’m a big fan of watching poker on TV. It’s not that I’m good at playing, but I love the atmosphere. Tension is the name of the game as you watch one player bet the house on a pair of kings. A car auction reminds me of that, and I really enjoyed it. People bid in thousands, hundreds, fifties and twenty-fives. I was waiting to see who would win and how much of a bargain they would get – I daren’t even scratch my nose for fear that I’d spend a grand! It’s the constant noise from the men with the gavels who sound like they’re talking complete gibberish. I just about managed to understand the prices as they rose and the phrase, “great car, great price”. Some of the deals on the night were incredible. Let’s take a 2011 Skoda Superb as an example. If you search any car-sales website for one of these you’ll see prices ranging from €13k to €19k. One sold for €8k at the auction – that’s a lot of car for a little money. As ever with buying a used car, auctions can carry an element of risk. There are no test drives. What you see is what you get. It is though possible to view a car in the days leading up to an auction. Just as if you were buying from a dealer or a website, you’d be well advised to take a mechanic with you to have a look at the object of your affections before bidding. A mechanic will at the very least be able to use their trained eye to see any obvious flaws. Bringing a mechanic to the lot in advance of an auction just makes sense. The auction I attended last week was a fleet and finance auction, and as far as I could tell, much of the mileage on the vehicles was “checked” – which means that the miles are proven to be legitimate. Other cars say that mileage is “unchecked” – this doesn’t mean the vehicle is clocked, but what it means is that they don’t have the paperwork to back up the mileage. Whether you go to Merlin’s, Wilsons, Paul Cooke Auctions, or any other auction house, you could be in line to get a very good deal. Take my advice though – as with any method of buying a used car – avoid landing a lemon and take someone in the know to view the vehicle for you. While the savings could be massive, the losses could be huge too. For what it’s worth, I think I’ll be taking the auction route for my next car. This article recently featured in the Sunday World newspaper’s Motormouth pages. 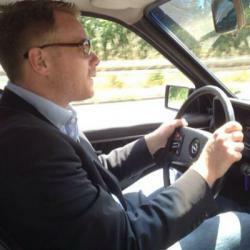 Daragh is Contributing Editor and founder of Motorhub.ie. Past and present motoring ventures include presenting MotorMouth on Newstalk 106-108FM and MPH on TG4. Daragh was also editor for Car Buyers Guide and contributor for Beo.ie. He set up the motors section on Newstalk.com and can be heard regularly on Rónán Beo @3 on Raidió na Gaeltachta. He’s a regular contributor to The Sunday World’s Motor Mouth pages and he also regularly contributes motoring content for the Irish language online magazine, NOS.ie.